"The title is spot-on; this book is chock-full of quick and easy projects that use washi tape as the prime material. From sprucing up switch plates and personal tech devices to creating custom wrapping paper, Courtney's book showcases the versatility of washi tape and the way its patterns can add color and detail in unexpected places. What I love most about this book a and washi tape in general a is that it's so flexible and customizable without a major commitment. " "- Design Sponge""
"Washi tape landed in our offices (and our hearts) a few years ago, and has continued to gain popularity every step of the way. The transparent tape originated in Japan and comes in countless colors & cute patterns. It is only slightly tacky, which means it's safe to use on even the most delicate surfaces. In this new craft book, you'll find over 101 cute & innovative crafts where washi tape shines. Author (and maker) Courtney Cerruti shares ideas for home decor, entertaining, fashion, and fun. Since opening the book (and promptly reading it cover to cover), we've personalized gift tags & updated our iPhone chargers. Next on the list? Geometric wall art! Trust us, it's time to stock up on washi tapea you'll have a long list of fun projects before you know it!" "- RueMag.com""
"The colorful Japanese masking tape is having a moment - crafters, designers, and more can't get enough of it. 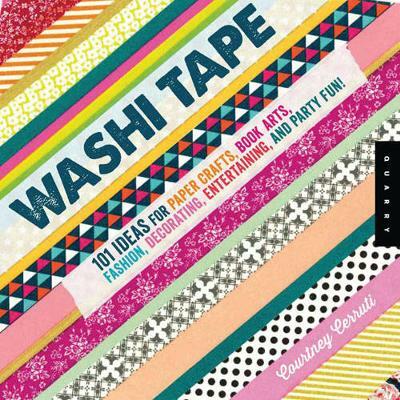 A new book, "Washi Tape: 101+ Ideas for Paper Crafts, Book Arts, Fashion, Decorating, Entertaining, and Party Fun!" by Courtney Cerruti, shares even more uses for the decorative tape." "- ElleDecor.com"
"Washi tape is a low-tack tape available in a variety of patterns and colors that is suitable for use on a variety of surfaces. Until a few years ago, the tape was primarily available in Japanese stationery stores or shops that specialized in Japanese products, but now it's available in most chain craft stores (and even the Target one-dollar aisle). Mixed-media artist Cerruti ("Playing with Image Transfers") has an extensive collection of washi tape, and she sings the praises of this versatile craft supply with a variety of small, easy projects ranging from the obvious (use washi tape to embellish a card) to the interesting (apply it to boring black heels for a pop of color) to the questionable (cut fake "rosy cheeks" out of washi tape and apply them to vintage photos). There aren't any instructions, but applying washi tape to a surface doesn't require a whole lot of direction, so the projects are pretty much self--explanatory. -VERDICT The book resembles a printed Pinterest inspiration board more than anything elsea lots of style and not a whole lot of substance. It's just a collection of pretty pictures of things people might want to make, all centered on the theme of washi tape." a Library Journal"
"Is there anything you can't do with washi tape? It's the best thing to happen to crafters since hot glue. It comes in a million colors and widths - and, according to author Courtney Cerruti, the possibilities are endless. After reading this book, I, too, am a believer. Washi tape makes everything better: brown bag lunches, coat hangers, even flower pots. If it will sit still long enough you can put washi tape on it and make it cuter. Since washi tape is easy to remove and reposition, it is also great for kids to craft with. Just ask my daughter: She is quickly depleting my stash." "- Jen Perkins, Blogher"
"Japanese paper tape has been a crafting darling for years, and Washi Tape by Courtney Cerruti offers unique ideas for dressing your surroundings with it. Perhaps the coffee table or your smartphone? The possibilities go on and on." - "Mary Levitski, Canada's Style At Home Magazine"
"Mixed-media artist Cerruti ("Playing with Image Transfers") has an extensive collection of washi tape, and she sings the praises of this versatile craft supply with a variety of small, easy projects ranging from the obvious (use washi tape to embellish a card) to the interesting (apply it to boring black heels for a pop of color) to the questionable (cut fake "rosy cheeks" out of washi tape and apply them to vintage photos). There aren't any instructions, but applying washi tape to a surface doesn't require a whole lot of direction, so the projects are pretty much self-explanatory. VERDICT The book resembles a printed Pinterest inspiration board more than anything elsea lots of style and not a whole lot of substance. It's just a collection of pretty pictures of things people might want to make, all centered on the theme of washi tape." "- Library Journal""
"If you need another reason to squirrel away a few more rolls of Washi Tape, meet your new enabler: Courtney Cerruti. The Bay Area artist treats readers to a playful craft collection that goes beyond utilizing the low-tack, decorative Japanese paper in mere scrapbooking projects and on gift wrap.... Bottom line: There's plenty of fun to go around, from a memory matching game and festive paper crowns to keepsakes, such as art pieces that capture a child's sweet silhouette."" - San Francisco Chronicle"